Northstar Building has over 22 years of professional building experience. We can provide everything you need for your home whether you need plans and permits or you already have them. Northstar has a long-existing track record of perfecting homes from start to finish. As a one-house vendor at a time for every facet of construction and building, we serve our clients both by executing a large variety of services in-house and by overseeing specialty work performed by our talented network of trusted and longstanding professionals. Northstar Building prides ourselves on our deep respect for our industry, and for the clients who preserve it. As our client, this means you’ll be well taken care of from day one through the day we hand over your keys. Litchfield Custom Homes, Renovations and Restoration Best of Houzz! Haver & Skolnick Architects is a national award-winning firm that merges architecture, interior design and landscape design. We create quality homes of timeless design, providing personal service & impeccable attention to detail. A rich tradition of New England Vernacular architecture inspires designs which reflect history while responding to a 21st century lifestyle. Founded in 1996, by Charles M. Haver, AIA and Stewart R. Skolnick, AIA, the firm’s current projects include new homes, extensive renovations and architecturally sensitive additions. Charles and Stewart guide their clients through each step of the process, from evaluating potential building sites to selecting the perfect tableware, once the home is completed. The goal is to make each project a pleasurable experience and to insure that the final result reflects their client’s vision. We create comfortable, classic, country homes and elegant New York City apartments which incorporate sustainable building practices and the latest technologies. Stewart received his architectural education from the University of Arizona and Cornell University, Charles from the University of Virginia. 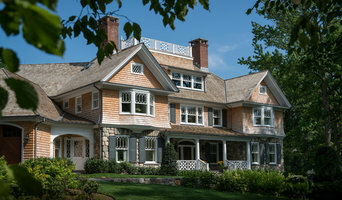 Prior to establishing their firm in Litchfield County, Charles & Stewart each held positions as Design Directors of major New York City architectural firms. Charles is the Vice Chairman of the Roxbury, CT Historic District Commission and Stewart has served on the Roxbury Planning Commission. Publications: The firm’s work has been published in national, regional and digital publications: Architectural Digest, Elle Decor, The New York Times, Fine Home Building, Garden Design, Period Homes, New York Cottages & Gardens, Litchfield Magazine, Connecticut Cottages & Gardens, At Home Magazine, Connecticut Magazine, Connecticut Home & Garden, East Coast Home + Design, Hudson Magazine, Passport Magazine, The Litchfield County Times, Greenwich Time. The firm's work has been published in two books; Leah Rosch’s book "American Farm Houses" and Gestalten's "New Romance, Contemporary Countrystyle Interiors." Charles & Stewart look forward to your call or email to set up a complimentary design consultation to review your project needs. TR Building and Remodeling, Inc. is an award-winning design-build firm in New Canaan, CT specializing in residential renovations, additions, and new construction in lower Fairfield County including Darien, CT., Westport, CT., Ridgefield, CT., and Greenwich, CT. Our in-house designers and builders take full ownership of the project and expertly guide you through every step of the process from design and budgeting to selections and construction. Design, aesthetics, functionality and budget are continuously considered by our team and reviewed with the homeowner. We have a passion for craftsmanship, attention to detail, and unparalleled service that raises us above our competitors. Hendricks Churchill is an architecture and interior design firm that specializes in the creation of beautiful buildings and homes. All Hendricks Churchill undertakings are defined by the single guiding principle of relevancy – to their client’s identity, to their environmental and historical setting, and to their architectural legacy. The Hendricks Churchill team of architects and designers embodies a breadth of vision and experience that allows them to explore architectural styles ranging from classical to the traditional New England vernacular, while undertaking select contemporary projects each year. With the ability to tailor its services precisely to every client’s needs, each and every Hendricks Churchill project enjoys the highest level of critical consideration in its vision, beauty, function, and sustainability. ABOUT US: Over the past 10 years, GULICK & Co. has been renovating and restoring homes from the shoreline to central Connecticut. We specialize in historic homes from the 17th century to the 20th century. We pride ourselves on our abilities to blend up to date technologies with the craftsmanship of the past. Through close collaboration, Gulick & Co LLC is able to meet their clients' goals while preserving the architectural significance of the house and property. OUR MISSION: We believe that through expert planning and design, older properties can retain their original character while showcasing up-to-date amenities. These goals are achieved with a solid commitment to build “green” by saving and reusing buildings and their materials. “Green” building promotes efficient insulation and heating and cooling systems, healthy indoor air quality, and the use of sustainable materials. THANK YOU: Thank you for taking the time to review our profile. We hope you enjoy browsing some of the work we've done, and look forward to connecting soon!